FORT BRAGG, N.C. — Attorneys for Army Sgt. Bowe Bergdahl are trying to send his court case "off the judicial cliff" by arguing that U.S. Sen. John McCain improperly swayed military decision-makers with public comments on the case, prosecutors said Tuesday. The arguments came at a pretrial hearing on defense allegations of "impermissible meddling" by McCain. The defense wants the judge to either throw out the charges or rule that Bergdahl will face no punishment if convicted. Maj. Justin Oshana, an Army prosecutor, argued there is no legal precedent for derailing a military trial because of comments from a member of Congress. "They are asking this court to take a leap off the judicial cliff," Oshana told the judge, Army Col. Jeffery Nance. The defense contends that the prosecution was influenced by McCain, who chairs the Senate Armed Services Committee. The panel has the power to approve or scuttle assignments for top military commanders. 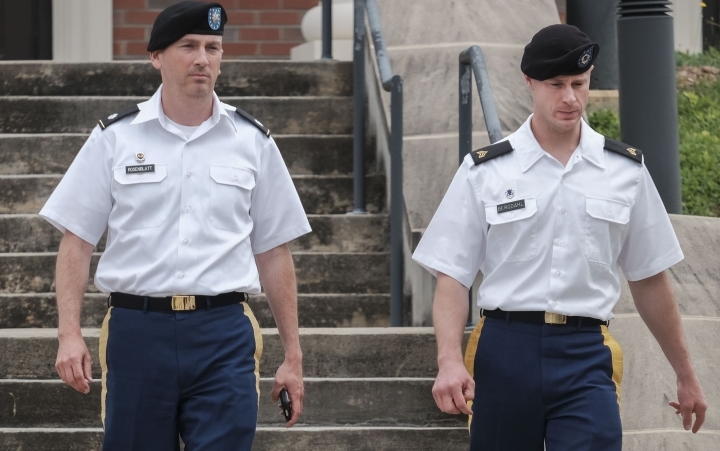 In September 2015, an officer who oversaw a preliminary hearing recommended that Bergdahl's case be heard by a misdemeanor-level tribunal and said imprisonment wasn't warranted. But the next month McCain told a reporter that the Senate panel would hold a hearing if Bergdahl wasn't punished. Weeks later, Gen. Robert B. Abrams sent Bergdahl's case to a general court-martial, rejecting the hearing officer's recommendation. 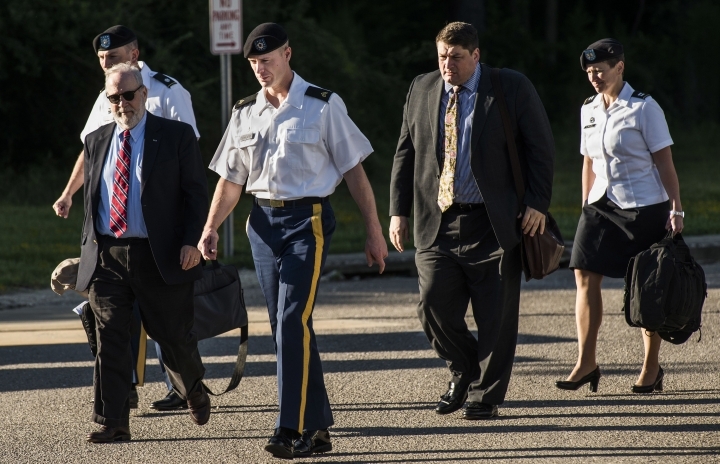 Defense attorney Eugene Fidell argued that McCain violated Bergdahl's due process rights as well as a military law prohibiting unlawful command influence. Fidell said McCain remains subject to the Uniform Code of Military Justice as a retired Navy officer. But Oshana said the senator wouldn't meet the standard for unlawful command influence because he "doesn't possess the mantle of command." "The fact that no other court has held this should be of grave concern to the court in being asked to be the first to do this," Oshana told the judge. In response, Nance quipped: "I don't want to be the first to do this either way," suggesting a ruling in any direction would break new ground. The judge said he would rule on the motion at a later date. Fidell countered that the lack of legal precedent only shows how egregious McCain's conduct was. "Until last October no retired person subject to the code who was elected to Congress has ever had the chutzpah to do what Sen. McCain did," he told the judge. Rachel VanLandingham, a former Air Force lawyer who teaches law at Southwestern Law School in California, said she believes McCain's comments have tainted the case. She said prosecutors' argument about the novel circumstances shouldn't be legally persuasive, but it may give the judge second thoughts about siding with the defense. "It's like they are preying on the judge's concern for things that he shouldn't be concerned about," she said in a phone interview. "Just because this is a different fact pattern doesn't mean this isn't unlawful command influence." A spokesman for McCain, Dustin Walker, declined to comment in an email. Earlier in the month, the senator denied that he had used undue influence in the case. "No one believes that. No one believes that," he said. "Lawyers can say whatever they want to; no one believes it." The hearing is scheduled to end Wednesday with testimony from Abrams. Nance said he wants to question Abrams about a separate defense motion seeking to disqualify the general so another commander can consider whether a court-martial is warranted. Bergdahl, who is from Idaho, walked off his post in Afghanistan in 2009 and wound up a captive of the Taliban and its allies until 2014. The Obama administration won his release by swapping him for Guantanamo Bay detainees. Bergdahl faces charges of desertion and misbehavior before the enemy, the latter of which carries up to a life sentence. Trial is scheduled for February 2017. In the McCain motion, the defense revealed emails from Army officials to Senate committee staff seeking to have McCain back off his comments. An email from the Army Office of the Chief of Legislative Liaison cited "serious concerns across the Army" that McCain's statement could help Bergdahl show unlawful command influence. That email was sent two days after McCain told a reporter in October 2015: "If it comes out that (Bergdahl) has no punishment, we're going to have to have a hearing in the Senate Armed Services Committee." Follow Jonathan Drew on Twitter at https://twitter.com/jonldrew .